The interim budget for the year will be presented to the Parliament on February 01, 2019. It will be an “interim” budget in the sense that it will hold only till the current government is in power, which is for two months of the new Financial Year (2019-20). Hence, the upcoming budget 2019 will be a brief plan of the government for these two months. Post the general elections which are scheduled for some time around mid-2019, the newly elected government (regardless of it being the currently ruling party or another) will present a full-fledged budget comprising its proposed schemes, planned expenditures, and sources of income. The outgoing government cannot announce any new major tax measures or expenditure schemes in the interim budget. Hence, the industry does not have too many expectations from it. Financial year 2018-19 witnessed a mixed scenario for domestic metal companies. While H1FY19 saw earnings rise sharply, volatility in metal prices and raw material costs is likely to eventually to lead to lower earnings in H2FY19. Additionally, with Chinese steel production ramping up, the ongoing US-China trade war, and the US tariffs on steel and aluminum, dumping activities into India have resumed. India has also become a net importer of steel in Q3FY19 from being a net exporter a year ago. Also, aluminum scrap imports have risen 21% yoy in H1FY19. Historically, the pre-election Budget tends to be largely neutral with only a few adjustments. 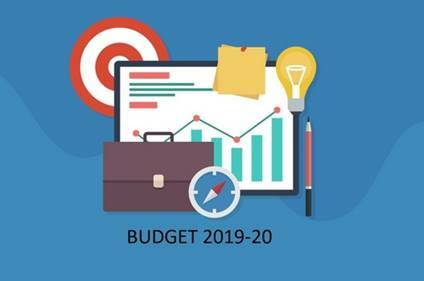 Thus, the focus for Union Budget 2019-20 would largely be diffused between the rural, MSME, and infra sectors. Metal companies are likely to continue to see healthy offtake as infra spending remains upbeat in 2019-20 as well. Some protectionist measures could be enacted to help metal companies remain competitive in an increasingly protectionist trade environment. Reduction in customs duty for pet coke, anthracite coal, met coke, and coking coal to NIL. Increase in basic customs duty for specific steel products from 10% to 12.5%-25%. Increase in basic import duty for stainless steel products from 7.5% to 12.5%. Raising customs duty on both primary aluminum and aluminum scrap to 10% each. Raising export duty on graphite electrodes to 30% and reduction of import duty to NIL from 7.5%. Read more. Although FM Jaitley has always maintained that farm loan waivers will not solve the issues long plaguing the farm sector, loan and interest waivers may seep through into this year’s budget. Apart from waivers, a farmer relief package may be released including support for the purchase of fertilizers, seeds, and machinery as well as the expansion of farm credit target, according to media sources. Increase in customs duty on Paper and Paperboard. Read more. The real estate sector in India is one of the most important and critical sectors as it contributes 6-7% of the GDP and generates a substantial amount of employment in the country. The sector currently employees over 50mn people and is expected to generate 10-15% jobs over the next five years. However, the Indian real estate sector has been going through a transformation phase after a series of reforms announced by the government over the last three years. First was the demonetization of high-value currencies announced in November 2016, which hammered the unrealistic price escalation caused by speculation-driven demand. The second was the implementation of the Real Estate (Regulation and Development) Act, 2016 (RERA), which became effective from May 2017 to enforce transparent and compliant culture on the realty players. Last, but not least, the introduction of Goods and Services Tax (GST) to bring tax discipline in the economy. Although these reforms established trust and confidence among home buyers, they also caused serious disruptions in the sector initially. Many realty players, particularly in the unorganized sector started having working capital issues and were forced to withdraw, delay or sell their projects to other developers. Demand has been adversely impacted as the investors kept away due to the possibility of no returns from investment in real estate as an asset class. Grant industry status to the entire sector. Bring down cement from 28% to 18% GST slab to reduce the cost of construction. Reduce GST on under construction housing projects from 12% to 5% tax slab. Put affordable housing in priority sector list for lending institutions. A separate department for time-bound approvals and clearances for the affordable housing space. Raise deduction limit of interest paid on residential house property which has been capped at Rs2 lakh under Section 24. Significant relaxation in income tax slab to enhance the purchasing power of home buyers or aspirants. Read more. Among other things, the automobile sector also has a few demands from the Budget. From the automotive scrappage policy, which aims to phase out vehicles older than 15 years from Indian roads, to a GST cut on two-wheelers boost demand, to the rationalization of tax rates for cars, the industry has asked for everything it needs from the government. Let’s take a look. Automotive scrappage policy and incentives for vehicle replacement: The policy, which aims to phase out vehicles older than 15 years from Indian roads, is being discussed for quite some time. The government may provide a one-time tax rebate or benefits for those scrapping their old vehicles; however, nothing has been finalized yet. The scrappage policy, if it comes into effect, is beneficial to the industry, as it will create a significant replacement demand. According to industry estimates, the policy could create incremental demand for 6-7 lakh Medium and Heavy Commercial Vehicles (M&HCVs) over the next 2-3 years. GST rate cut on two-wheelers: Heads of TVS Motor Company Limited (TVSM) and Hero MotoCorp Limited (HMCL) called for a cut in the GST rate on two-wheelers (2Ws) from 28% to 18%. According to the two gentlemen, 2W is a mass mobility item used by the common man, and hence, its tax rate slab should not be same as that of luxury and sin goods (28%). The transition to enhanced safety norms and BS-VI emission standards will raise the price of vehicles starting FY2020. Hence, a cut in GST will provide much-needed relief and boost demand. Rationalization of tax rates: Several auto industry participants have asked for rationalization of tax rates for cars, with not more than two tax rates for cars, in place of multiple tax rates prevalent currently. Further, they expect a special rate for EVs, given the government’s aggressive push towards vehicle electrification. Read more.